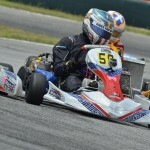 The CIK-FIA U18 World Championship started its 2012 season on the first weekend of July (6th – 8th of July) at Portuguese Braga. Among the 71 drivers from more than 30 nations were three drivers of the Mach1 Motorsport team. Swiss Randy Berglas ended up in the big finale. From a sportive point of view, strong competition awaited the three drivers of the team. Among the 71 participants were the fastest drivers of the world and it was important to show a steady performance throughout the three racing days. Even though it didn’t look like it after qualifying, Swiss Randy Berglas managed to do this best of all in the end. On the drying track he had chosen the wrong tires during qualifying and came in last. During the Heats he then increased his performance maximally. Having started from 28th position each time, he finished the races on 11th, 13th, 14th and 18th positions and thus qualified for the finals on Sunday as the 32nd driver. During the first pre-final, bad luck caught up with him once again though. A technical difficulty forced him to make a pit stop and he was only able to finish the race with one whole lap behind the others. During the second race, in reversed starting order, he used his position in the second row and finished on the remarkable 4th position. That earned him the 18th starting position in the finale and he established himself in front midfield. He didn’t manage to see his performance through to the end though. An opponent collided with his kart and he had to end the race prematurely. “It was a sad ending for Randy of course. He had driven great races and done a really good job. I’m excited for the further course of the season, because a lot is still possible”, complimented Hetschel. 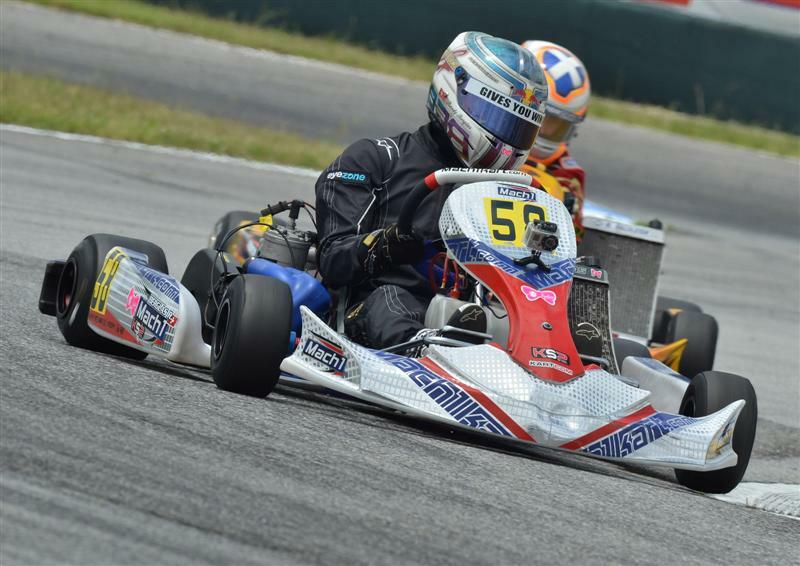 Germans Lukas Korsch and Chris Dahlmann also started in Mach1 karts. Both of them had only limited international experiences, but put up a brave fight nonetheless. Korsch was the 48th driver after qualifying and would have had a legitimate chance of entering the finals if it hadn’t been for two fallings out during the Heats. On Sunday morning he was the second best German and fought for Championship points during the B-finale. Unfortunately, he was involved in a collision right after the start and had to follow the field with a huge handicap. Still, he managed to gain a couple of positions and finished the weekend on 21st place.